Internazionale Starting XI: Samir Handanovic, Caner Erkin, Andrea Ranocchia, Cristian Ansaldi, Miranda, Danilo D’Ambrosio, Yuto Nagatomo, Geoffrey Kondogbia, Felipe Melo, Rodrigo Palacio, Stevan Jovetic. This very humid Saturday afternoon saw fit for a monster clash of football royalty. As part of the International Champions Cup, two of the biggest names in Europe, Bayern Munich and Internazionale Milano took the pitch. Bayern started the game in full attack mode getting the first shot on goal in the 2’. Franck Ribéry took on two Inter defensemen and slotted a low cross in front of goal. Through a cheeky move, Julian Green stepped in front of the keeper Handanovic and almost nutmegged the first goal for the German giants. 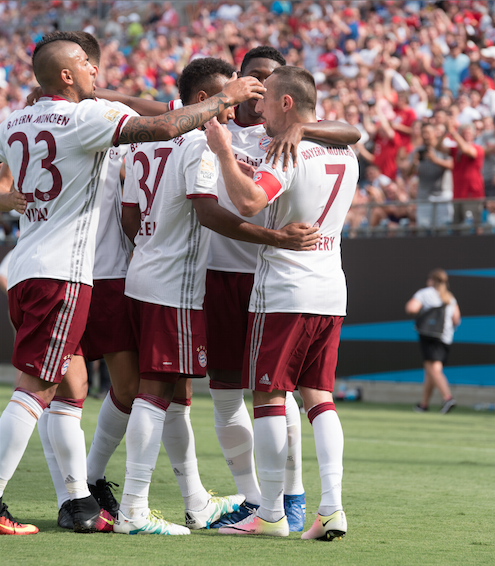 Munich finally hit pay dirt when David Alaba launched a cross a few yards from the corner flag and found Julian Green with a diving one-time strike. Bayern took the lead 1-0 in the 7’. Inter returned on the offensive when Rodrigo Palacio sent a cross in to Stevan Jovetic who tried to back flick keeper Tom Starke but wasn’t successful. That offensive response by Inter was met with a massive counter attack that led to an easy tap-in for Franck Ribéry. This Internazionale looks nothing like the Inter of old. Once led by Jose Mourinho, Inter was a force in Italy and Europe. Once having players such as Samuel Eto’o, Zlatan Ibrahimovic, Javier Zanetti, and Esteban Cambiasso, they have nowhere near the star power they once had. The game had been physical from the start but in the 23’ Inter’s Felipe Melo came up hard behind Ribéry forcing him to collapse. The Frenchman stood up quickly and approached Melo but the two were separated quickly. At the restart, a beautiful lead pass beat the Bayern backline but Inter’s Yuto Nagatomo came a few steps short. To continue the horrendous start for Inter, Danilo D’Ambrosio made a fatal error in missing a header which allowed Ribéry and Green to penetrate Milan’s defense. Even while outnumbered in a two-on-four, Ribéry calmly passed the ball off to the confident American who put just enough english on the ball to glide across the pitch and find the corner netting. With Green’s second goal, the German Giants found themselves up 3-0 in the 32’. It was beginning to look like a long game. With a few of their starters on the bench, Milan’s horrific defense made me wonder if they would abandon ship and put in star defenseman Davide Santon. If things weren’t already bad enough, just as I was typing that last sentence, Arturo Vidal laid a ball off to Rafinha who served an absolutely wicked cross into the star of the day, Julian Green. Julian Green netted his hat-trick in a mere 35 minutes. Just as Cristian Ansaldi was making headway on a breakaway he was fouled just outside the corner of the 17-yd box. The free kick would prove to be a waste and Bayern was fast on the counter. Perhaps Milan was in deep prayer during the free kick because Bayern had a 5 v 1 on the counter and the final pass was misplaced, sending the ball out of bounds and ending the half. The 2nd Half saw a few substitutions but Bayern pretty much pulled back after that onslaught in the 1st Half. The numbers told the true and familiar story of woe for Inter fans. They had a total of 2 Shots on Target and a disappointing 26.9% possession that tells the real story of distress for the club. If it was any consolation, Mauro Icardi found the scoresheet in the 90’ to end the clean sheet opportunity for Munich. The gang from Milano will be looking forward from this horrific match, trying to forget that massive drubbing they suffered at the hands of what could be considered Bayern’s B-Team. He was implying the prowess of Julian Green and how he dominated the pitch. I caught up with him to ask him what I’m sure all Americans were wondering after this match. 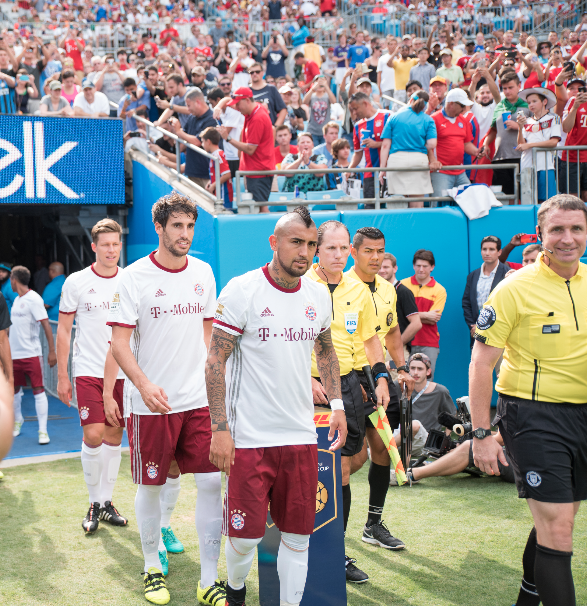 It was a great day for fans, a great day for Green, a good show for Ribéry, and sadly one to forget for Milan. But at the end of the day, the fans win because the players stayed afterwards for photos and autographs which had adults and children alike smiling from ear to ear. Isn’t that what this is all about?